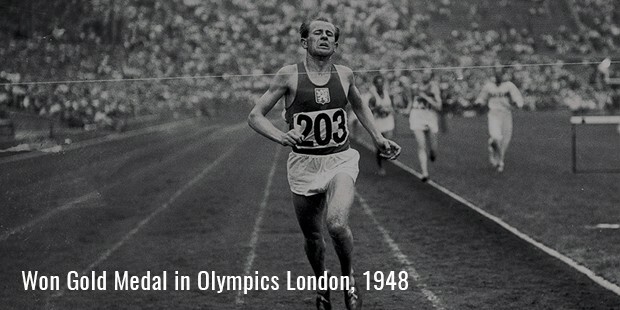 Emil Zatopek is considered as the greatest long-distance runners of all time. He is the only person to win the 5,000m, 10,000m and Marathon in the same Olympics. He is the first person to break the 29 min barrier in the 10 km. He has also broken the 1-hour mark for the 20 km. In 2013, Runner’s World Magazine selected Zatopek as the ‘Greatest Runner of All Time’. He has been nicknamed ‘Czech Locomotive’ by his followers in his home country Czechoslovakia. He has won 4 Gold medals and 1 Silver medal from the 1948 London Olympics and the 1958 Helsinki Olympics. 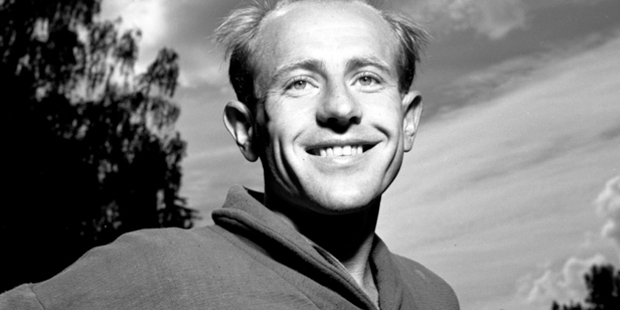 Emil Zatopek was born on September 19, 1922 at Koprivnice, Czechoslovakia. He was born in poor family and had to start working at the age of 16 to add to his family income. He was the sixth child in his family. His first job was at a Bata shoe factory in Zlin. This is where his running career began. One day the factory’s sports coach asked him and three others to run in a 1,500m race. He refused to run giving the excuse that he was unfit and weak. After an examination with the doctor, he was given a ‘No Ailment Certificate’. Now Zatopek was forced to run, and he impressed by coming second in the race. Initially he disliked running, but as soon as he started he felt the desire to win and this is how his interest in running germinated. Soon he joined a local athletic club and began making his own training schedule. He idolized Finnish long-distance runner Paavo Nurmi but chose a unique running style different from him. After 4 years of hard work, his training regimen and running style finally paid off as he was able to break the Czechoslovak records for the 2,000, 3,000 and 5,000 meters in 1944 at the age of 22. 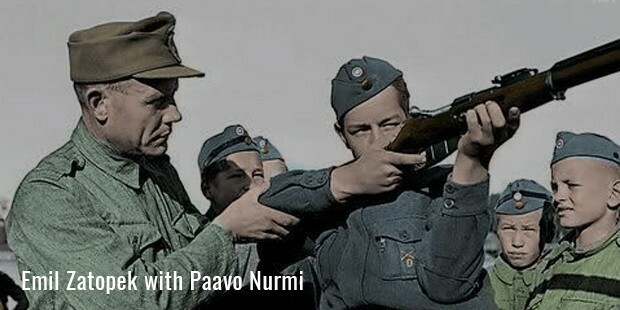 Very soon he joined the Czechoslovak Army, where he continued his grueling training sessions. 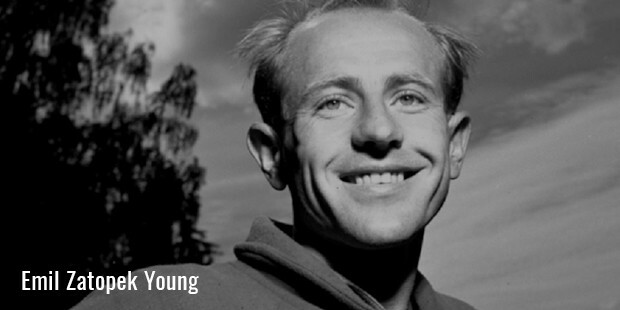 In 1946, he first came into the limelight when he bicycled from Prague to Berlin and participated in the Allied Occupation Forces meet in the 5,000 meters category and went on to win it. That year he was selected to the national team for the 1946 European Championships and came 5th in the 5,000m. Next came the 1948 London Olympics and he did not stand any chance to win a medal at that event. But he caused an upset when he won the Silver medal in the 5,000m and a bigger upset when he went on to win the Gold medal in the10,000m. This was only the second time that he was running a 10,000m race in his career. In the 1950 European Athletic Championships held at Brussels, he went on win both the 5,000m and the 10,000m. 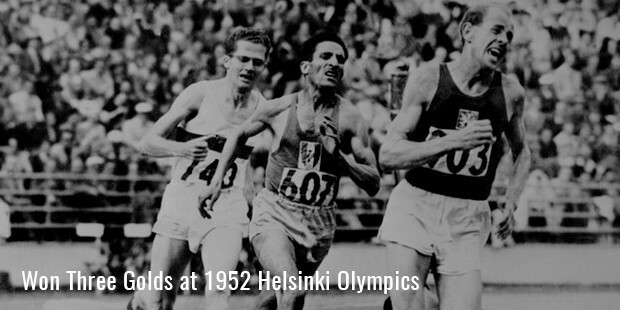 Now came the 1952 Helsinki Olympics, which would become the greatest event in Zatopek’s career. He went on to win the Gold in the 5,000m and 10,000m comfortably. But he made headlines when he decided to participate in the Marathon at the last minute and went on to win it by setting a World Record. He had won three Gold medals in the three longest running events in the Olympics which made his feat even greater. He had become a sporting star in his country and throughout the world. He has set records in nearly every distance that he has participated in including 5km, 10km, 20km, 25km, 30km and the Marathon. Even today he is one of the most respected and honored sportsmen ever.